Effectively managing an overwhelming amount of regulatory records and documents, both paper and electronic, is an ongoing struggle for life sciences companies. Many times, departments operate in silos using separate document management methods and systems making it impossible to control risk, gain visibility, prepare for audits or ensure compliance. 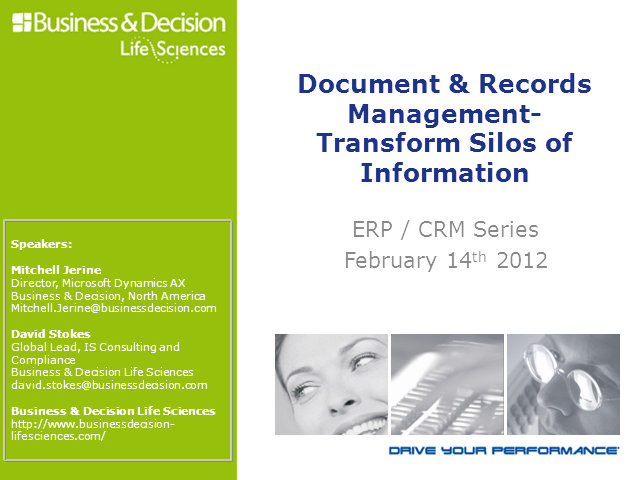 In this webcast, you will learn how to transform your silos of information and integrate document and record management as an integral part of an ERP system. This is the fourth in a series of five live webcasts by Business & Decision life sciences experts designed to help you optimize compliant business processes, reduce operational costs and improve margins.